Cerritos, CA – MMHR came out to Cerritos College Saturday May 11th to watch the 3rd Annual Cavalier Classic put on by Gardena Serra High School. 16 teams and 240 players representing California, Arizona, and Nevada participated. The opening game was an excellent way to start the day off. Lynwood came out strong behind Dashawn Hill(2014), 6’8″ P/F, hitting the offensive glass turning them into easy baskets. Renaissance countered with the Kosta Jankovic (2015), G/F, hitting 1 dribble pullups and penetrating and kicking for assists. The 1st quarter saw RA take a 1 point lead(15-14). Jankovic continued to hit the 3 ball, but L-wood did not falter and tied the game up at half(28-28). Jankovic kept the 3 ball coming added a Dirk Nowitzki-like pull up in the key. Kevin Miller(2014), 6’2″ SG/PG, stepped up with quick finishes at the rim and nice jump shots in transition. RA fed the ball down low to Marty Gaizaukas, 6’5″ F. He is tough, gets good position, and battles down low. L-wood took a 1 point lead going into the 4th (39-38) with pressure D. With 2nd shot opportunities and pressure D, Lynwood won 47-45. The next game was quite the opposite of game #1. SVC from the opening tip jumped on Locke HS and never looked back winning 100-45. Three players stood out for SVC. Miles Seward (2014), 6’2″ G, is a bouncy athlete. He came out and took the opening tip in for a dunk. Miles uses shot fakes to make plays off the dribble. Eric Rwahwire(2015), 6’1″ F, is an undersized post. He is a strong finisher with a good body. Hunter Irshad (2016), 6’8″ F, is a promising prospect. He needs to work on a post up game. Hunter moves well without the ball. He looks like a taller Nick Stover(LMU/Winward HS). Whether Hunter becomes a “true post” or “stretch 4” will determine the level of D! basketball he plays at. Mayfair came out quickly and took a 21-9 lead. Muir responded in the 2nd quarter and cut the lead at the half(32-24). In the 3rd quarter, both teams went back and forth with Mayfair maintain a 10 point lead going into the 4th(44-34). Then Mayfair took it up a level with a 21 point quarter and won 65-51. Mayfair was led by Kendall “MR. BIG” Small(2015), 6’0″ PG. He makes acrobatic finishes at the rim for AND1s. Small has a nice pull up jumper that is always under control. He has a nice burst, athletic (throws it down), and his footwork is on point. Defensively, Small has quick hands that allows him make a lot of steals. Muir was led by Dejon Williams(2014), 6’1″ PG. He is tall, rangy, and long. Williams makes good post passes. He uses a crafty hesitation and change of pace move. Williams needs to work on his shot. MMHR got a chance to talk to Mayfair’s Michael Nwabuzor(2014), 6’1″ PG, Dillion Reise(2104), 6’5″ W, and “MR. BIG” aka Kendall Small(2015), 6’0″ PG. MMHR: How’s your season going so far? Is it living up to your expectations? MN: Good! We had big wins over Bosco, Etiwanda, and Compton. Yes it is. Higher! Coming in with new players, you did not know how it would work. But winning big games and going to the final of the Redondo tournament has changed that. DR: The team has exceeded expectations. We layed a couple of eggs in the NOR and Torrey Pines tournament. But, we had a team meeting and worked things out. KS: Good! We have a tough schedule. The transferring situation has been smooth. It was tough in the beginning, but we worked it out. MMHR: Up to this point in the season, what team has been your toughest matchup? MN: Etiwanda…They play together and tough D. Even though we were down by 13 points, we came back at the Top Flight Challenge. DR: Bosco…Etiwanda…Compton. They were bigger and stronger. Westhaven Christian(NC) had good athletes and two strong guys. Also, Cantwell Sacred had size with the big Serbs. KS: Etiwanda! Even without Jordan McLaughlin(USC signee), were tough. MMHR: Are there any camps or showcases you will attend in the off season? MN: I had a torn patella last summer so I missed camps and showcases. But this time, I will do some things with Superior Athletes unsigned SR team. DR: I will do some things with Superior Athletes unsigned SR team. KS: I will also play with Superior Athletes. As far as camps, I will do the Reebok Breakout, the Nike camps, NBPA Top 100, and Pangos AA Camp. MMHR: What are your strengths and weaknesses? DR: My strengths are my shooting, spotting up and off the dribble. And getting to the basket with my left hand. As far as weaknesses, I need to improve on guarding small, quick guards and getting more consistent with my right hand. KS: My vision, mid range shot, getting to the hole and creating for myself and the team are my strengths. I need to work on my free throw routine, free throw percentage, and get a more consistent pull up J. This game was a tight affair throughout. The 1st quarter produced a 1 point lead for RHP(11-10). The halftime score was 28-28. In the 3rd quarter, Lawndale exerted its quickness and shot blocking abilities to take a 55-41 lead into the 4th. RHP made a rally, but in the end it was not enough as Lawndale won 68-60.
is very athletic. He has quick ups. Jones showed a nice left hand hook to the middle of the key and a reverse pivot face up jumper. He needs to work on his post up game. Chimezie Metu (2015), 6’9″ F, is a bouncy athlete. He blocks everything in sight. In the 1st half alone, I counted 5 or 6 blocks by Metu. On one possession, he blocked a 3 pointer by the opposing player, grabbed the ball out of the air, and dribbled the ball up the court for a thunderous dunk. Metu has no post up game, but he passes the ball well from the high post. 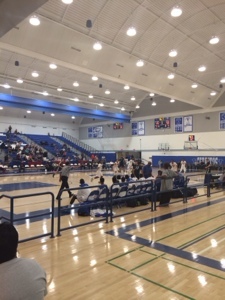 The host school, Serra, played a South Bay area rival in Peninsula. Both teams came out ready to impose their wills in each other. This made for a close and exciting 1st half(40-37) with Serra up. The 3rd quarter was a replay of the 1st half, as Serra tried to pull away but Peninsula did not go away. Heading into the 4th quarter, Serra had a 51-50 lead. In the 4th quarter, Serra said enough is enough as it put together a 24 point quarter and won 75-62. Player of note in this game was Stanley Roberts, Jr.(2014), 6’8″ 235 Post. He has a big body with a solid frame. Roberts finishes strong around the basket with bounce, and has a nice shooting stroke. He makes good passes out of the post. Roberts needs to improve on back-to-the-basket moves. On the defensive end, Roberts has good post “D”, and alters shots. The first out-of-state matchup featured California versus Nevada. The 1st quarter was neck and neck as SA and Clark played to a 13-13 tie. In the 2nd quarter, Clark let it be known they were in the house with a 24-20 lead at the half. In the 2nd half, SA represented by taking control of the game and won 49-41. The second out-of-state matchup featured Cantwell out of Montebello against Sunnyslope out of Arizona. Cantwell controlled the whole game as it won 52-44. Joey Covarrubias (2014), 6’2″ PG, ran his team to perfection. He got the ball to his shooters, bigs, and took timely shots. Joey has a game resembling a less athletic Jamaal Tinsley. There is nothing fancy about his game. Joey gets to the hole and finishes strong for AND1s. If you leave him open, count it. The jumper is wet! Joey ended up with 22 points .